Swedish registration number HOC 126. This car was exported to Sweden as a ”CKD”, Crated Knocked Down. The chassis with cowl was exported in a huge wooden box and the car then assembled by General Motors in Stockholm. The huge convertible body was designed and built by Nordbergs Vagnfabrik in Stockholm, a company that had built bodies for horse-drawn vehicles and cars since the beginning of the 20th century. They were known for their elegant bodies on Rolls-Royce, Isotta-Fraschini, Mercedes-Benz 540K, Packard and many other fine cars. 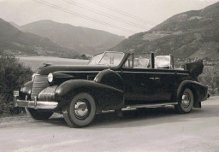 Reputedly this Cadillac had in 1939 the longest convertible top in the world built in one piece. It is remarkably easy to raise or lower the top due to a special construction with a springloaded counterweight in the trunk. The car vas built for the managing director Martin Waldenström of Grängesberg AB (one of Sweden’s oldest mining companies) and used at his manor at Nådhammar in Södermanland (south-west of Stockholm). For many years it was widely used in Sweden and abroad as a rally car by Bert Andersson, one of the foremost enthusiasts for old cars in Sweden. 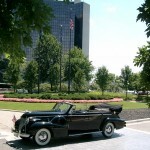 Anders Läck is now the third owner of the car, which has been brought to the USA for the Cadillac 100 Year celebrations in 2002. It has taken part in many rallies, as in Scotland/England in 1996 and the Rally Mondial in France 1998.